In these economically challenging times, cost is an important consideration for many people. 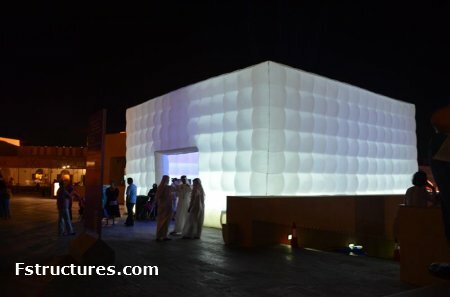 Happily, because air structures can be installed in just a matter of hours, they often cost far less than a traditional marquee or other temporary building. Ashley Austin, company director at Evolution Dome, explains: "We know people are trying to save money wherever possible and that's why we believe our air structures are a superb cost-effective choice for any kind of event. "Our vast range of stylish designs includes simple models such as the Inflatable Wall through to incredibly versatile modular systems such as the Turtle GTS, which can be configured to cater for any need. "Less time spent installing and dismantling these air structures means less costs passed on to our customers. This, combined with our reliable power generator packages, means people can hire one of our products for far less than they might think." Ashley and his team at Evolution Dome pride themselves on their dedicated approach to customer service. So, whether hiring one of the company's Inflatable structures for a wedding, product launch or music festival, customers can rest assured they're in safe hands. "We've worked with a huge range of clients, including Nissan, Magners and the BBC," explains Ashley, "and we work with all our customers every step of the way to ensure they're happy. Staring from an initial brief, we first help customers choose one of our air structures, and then we see how we can help them in any other aspect of planning their event. "For example, some customers require sound and lighting packages or a stage – not only can we supply all of these, our experienced team can install them and have your event up and running in no time." Because there are no beams or poles to worry about, Evolution Dome's range of air structures can be customised for any occasion. Each product can be branded or decorated in almost any colour and design and configured to give you complete creative freedom. For example, the mighty Trident Dome can incorporate a stage and theatre-style seating for up to 450 people, while at the other end of the scale, the compact Luna Dome can be installed in 20 minutes to provide a stylish covered area for use as an outdoor bar or VIP area. In fact, this product was used as Santa's grotto for a hugely successful event in Barry, near Cardiff, last Christmas! 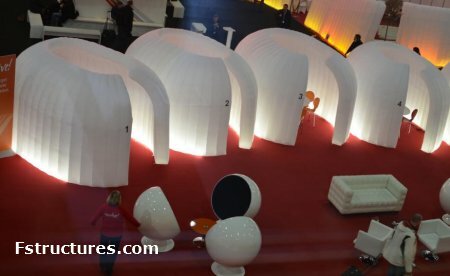 Evolution Dome's fresh approach and excellent customer service has seen its air structures steal the show at high profile events across the UK and Europe. Breathe new life into your event today - call a member of the friendly, dedicated team at Evolution Dome today on 0844 3351 933 or fill out an enquiry form here.